The reverse osmosis systems reviewed here on RO-System.org come complete with all of the components you will need to install the system and enjoy cleaner, healthier water. This guide highlights the best and most popular reverse osmosis accessories that you may want to upgrade or improve your RO system. Whether you are considering a reverse osmosis system or already have one, you need to know the quality of your water. You could send away a water sample and get a very detailed report of your tap water quality, but it is expensive and time consuming. If you test your own water with some inexpensive tools such as those shown below, you will know exactly which features you should consider as part of the RO system you choose or as accessories to add later. A simple, hand-held TDS meter can give you a good reading of the total dissolved solids (TDS) in your water. TDS is an measurement of all inorganic and organic substances contained in a liquid that are present in a molecular, ionized or microgranular suspended form. A TDS Meter tests electrical conductivity in the water, which it then uses to estimate the TDS level. Using the meter is simply a matter of dipping the device in a glass of water. 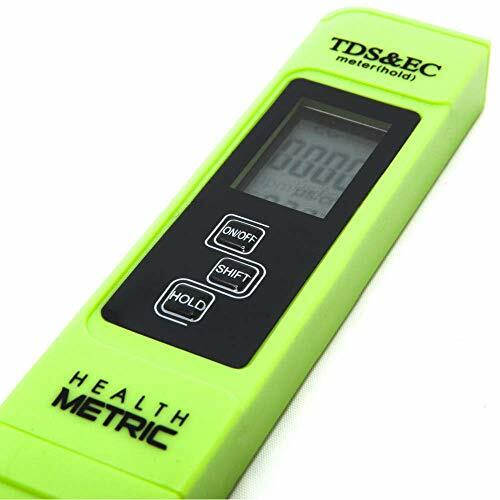 We recommend the Health Metric Professional TDS ppm Meter as the best TDS meter to get. It has proven to be a popular way to check for the general impurity level in your water. Unlike some other testers, this model can compensate for water temperature, which makes it easier to get reliable readings. Once your RO system is installed, you will need to monitor the water quality in order to know when to change the filters. The filter replacement timelines published by manufacturers are averages based on ideal conditions and may not apply to your situation. You can continue to use a hand held test meter like the one above or you can install a device that allows you to monitor the TDS constantly. An RO system that is functioning well should reduce TDS in water by about 90% and as filters age, you will see this number decrease. 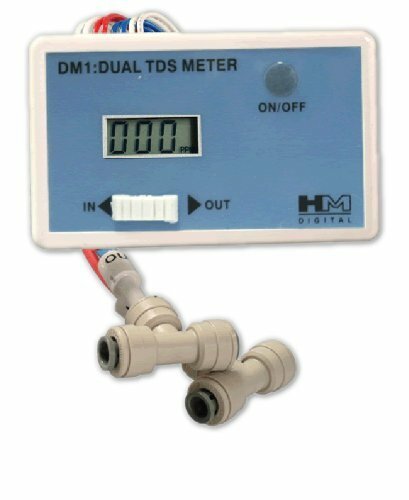 HM Digital DM-1 In-Line Dual TDS Monitor installs under your sink and connects to both the incoming and outgoing water lines so that you can get accurate comparison readings between the two at any time. Another option is to check your water with an at-home water test kit. 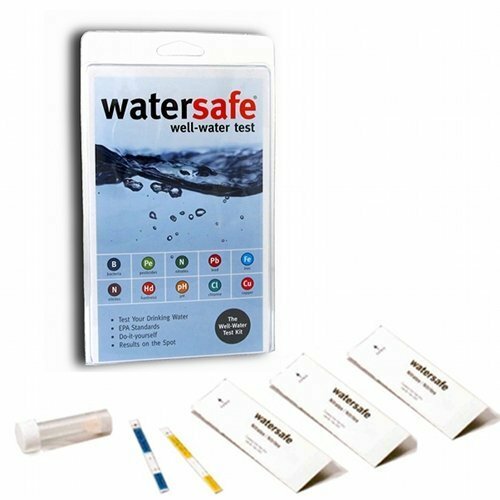 These will allow you to test your water for bacteria, lead, iron, copper, pesticides, nitrates/nitrites, chlorine, hardness, and pH as recommended by the EPA. Many factors, including whether you are on well or municipal water, will affect which impurities you may find. Drinking Water Test Kit - 10 Minute Test are some popular options. If your water tests positive for bacteria (which is more likely with well water), you will want a UV filter as part of your RO system. In most cases, we recommend choosing a base system that includes the UV filter as a standard feature, since it will save you money and simplify the setup. However, if you would like to add a UV filter to your system after installation, it is possible. Keep in mind that a UV filter requires a 110V power outlet under your sink. iSpring UVF11A UV Disinfection Sterilizer Water Filter with Smart Flow Sensor Switch is a popular way to ensure that 99%+ of the bacteria in your water is killed before you can drink it. Ultraviolet Light Water Purifier Reverse Osmosis UV Sterilizer. It gets good ratings but does not have as many reviews to back it up as the iSpring model above. Automatic shutoff valves work by automatically shutting off production when the water tank pressure reaches approximately 65% of the incoming line pressure, indicating that the tank is full. Systems without an automatic shutoff valve continually send rinse water to the waste drain even when the tank is full and the filters are not producing more clean water. They are a must if you want to avoid wasting water. 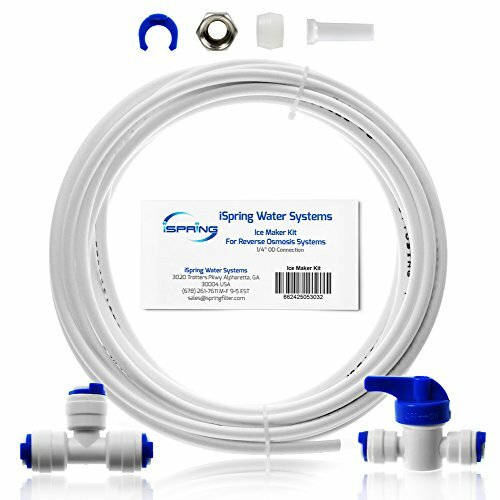 The iSpring AAS2 Reverse Osmosis Water Filter Automatic Shut-Off Valve is a well-rated and simple device that will fit into any system with the standard 1/4″ tubing. JOHN GUEST 1/4" One Way Check Valve. 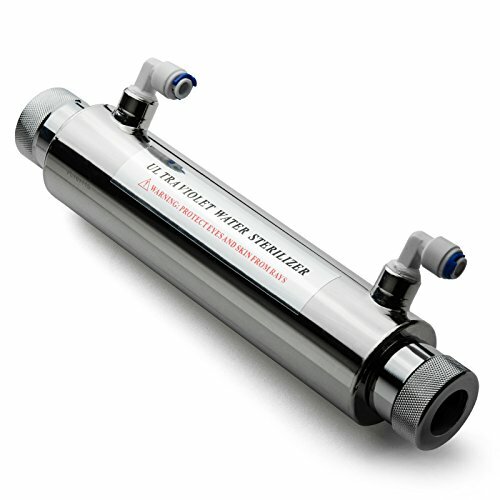 Another reverse osmosis system accessory that you may want is a larger pressurized storage tank. All storage tanks contain both a rubber bladder to hold the filtered water and an air-filled pressurized diaphragm that increases the water pressure to your faucet. Since the diaphragm takes up space, the “usable” volume is always lower than the actual tank volume. 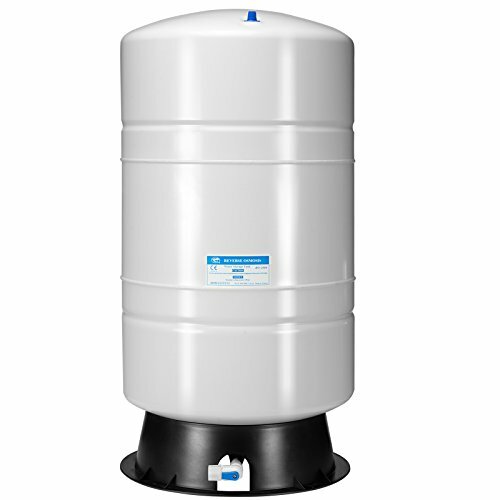 Most of our recommended systems come with a storage tank and it is almost always 4 gallons (3.2 usable) in size. Once filled, you can quickly get up to 3.2 gallons of filtered water from your faucet. However, if you go through a lot of water for cooking, to maintain a fish tank, or for anything else, you may find that 3.2 gallons is not enough. The larger tanks listed below will still fit under the average kitchen sink, but hold more filtered water. Any storage tank can be installed either standing up or laying down. One popular upgrade option is the APEC TANK-14 14 Gallon Pre-Pressurized Reverse Osmosis Water Storage Tank. It works the same as a smaller tank but provides 10 usable gallons of pre-filtered water at any time. Four of the advertised “14 gallons” in this tank are used by the pressurized diaphragm. 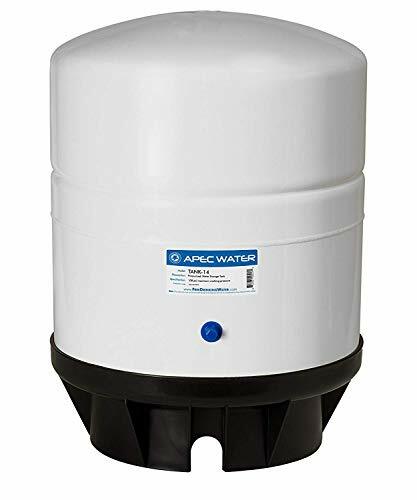 If you need even more water storage, then check out the iSpring 20 gallon tank with 14 gallon Storage Capacity Reserve Osmosis Water Storage Tank. It is listed as providing 20 gallons (14 usable). 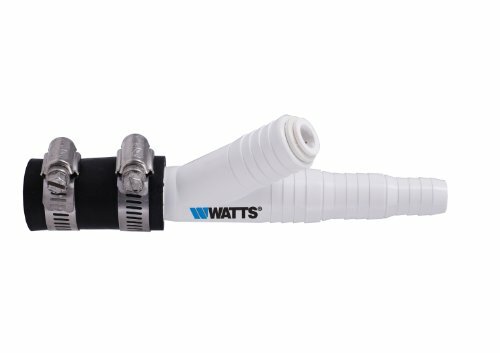 Note that it comes with a 3/8″ hose connector, when most RO systems use 1/4″ hoses, so you may need an adapter. Some of the systems we recommend come with a permeate pump as a standard feature and when they do, we rate them higher for it. 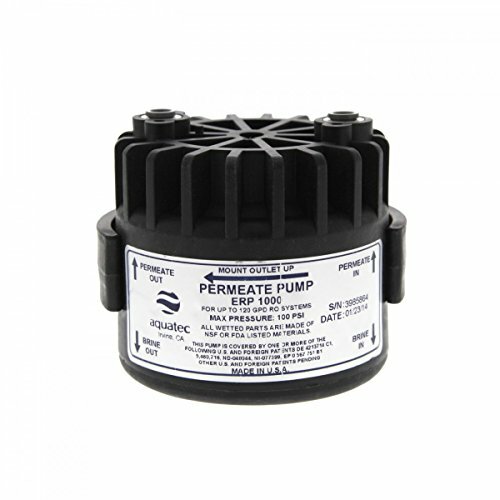 A permeate pump is a non-electric device that increases the pressure of the water entering your RO system. By raising the pressure, the system becomes faster, more efficient, and wastes less water to clean the filter membrane. If you are on municipal/city water and pay per gallon, there could be significant cost savings to increasing the efficiency and decreasing the waste of your system. If you don’t like to waste water or simply want your system to filter water more quickly, a permeate pump is an essential reverse osmosis accessory. You can add either of these pumps to any system. The term “gallons per day” (GPD) is not the maximum amount of water that a pump can handle but an indication of how fast it can push the water through your system in a given day. 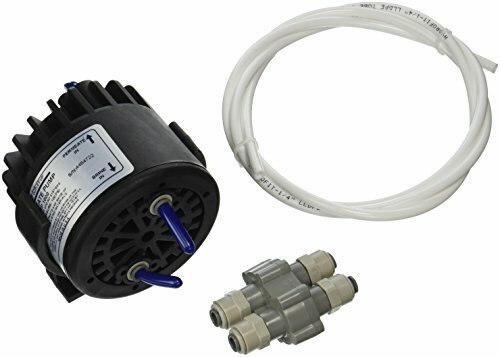 The Aquatec ERP-1000 Permeate Pump is the same pump that comes bundled with some of our recommended systems (such as the Home Master TMHP HydroPerfection) and is highly rated by reviewers. 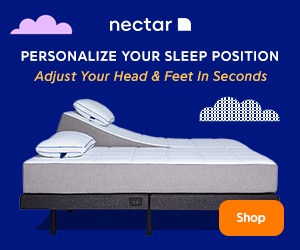 It is designed to work with systems that process up to 100 gallons per day (GPD). You can also get the same Aquatec ERP-1000 pump in a kit that includes some extra tubing and an automatic shutoff valve. Since you are going to drink filtered water, you would probably want your ice to be just as clean. Many people agree and add an ice kit to their reverse osmosis system. A refrigerator ice kit is simply extra hose and connectors that allow you to run a filtered water line to the ice maker in your refrigerator. A couple of our recommended Home Master brand systems can be upgraded to include an ice kit when purchased, but these recommended accessory kits can be added to any system. The most popular ice kit is the iSpring ICEK Ultra-Safe Fridge Water Line Connection and Ice Maker Installation Kit. You may find that you need extra tubing and connectors to customize your system. This could be because the standard refrigerator ice kit is too short to reach the distance to your refrigerator. Or perhaps you don’t want to just flush waste water down the drain and would rather divert it outside to a rain barrel instead. In any case, these options provide the extra tube length you may need to connect any reverse osmosis accessories. 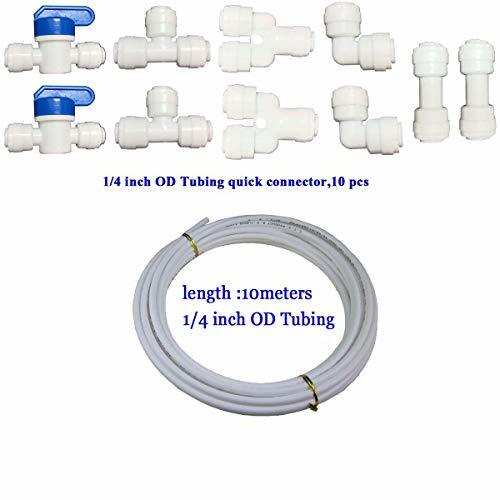 The YZM 10 pcs 1/4″ Quick Connect Push In to Connect Water Purifiers Tube Fittings is a kit that includes 32 feet of tubing and an impressive collection of 10 quick connect push-fit connectors. If you need more distance without all of the connectors, the PureSec 2017 20WP1/4TU-BLUE NSF Certified CCK Blue PE Tubing/Hoses is just extra tubing. It comes in a variety of lengths from 15 to 60 feet. 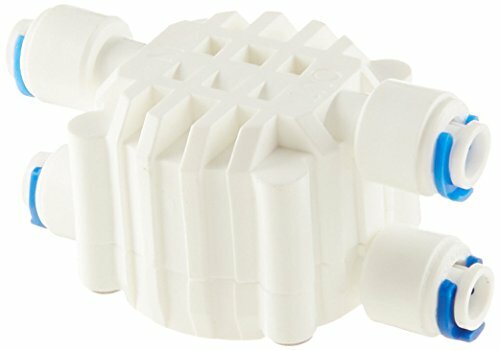 To be covered in any scenario, the Neeshow 1/4″ OD Quick Connect Push In to Connect Water Tube Fitting Pack Of 10 provides 10 compatible connectors in 5 different styles. If you already have a dishwasher connected to the drain pipe under your sink, then check out the Watts Premier 164020 DLA-D Drain Line Plumbing Adapter. It is a very practical and popular way to connect your RO waste water line without modifying your plumbing pipes. All of our recommended under-sink systems come with a water dispensing faucet that must be installed above the sink. In most cases, the included faucet is a basic silver color with a chrome finish. If you prefer a different or higher-end look in your kitchen, there are a number of faucets you could install instead of the default included with your RO system. The following are well-rated and compatible with all RO systems. One of the highest rated faucets we could find is the APEC Water FAUCET-CD-COKE-NP Ceramic Disc Designer Faucet. APEC also makes some of the most popular reverse osmosis filtration systems so it makes sense that they would also make solid reverse osmosis accessories. The Metpure Reverse Osmosis 360° Swivel Kitchen Sink Drinking Water Purifier Filtration Faucet comes in different finishes. The KES Ro Faucet, Reverse Osmosis Faucet for Drinking Water Filtration System also comes in different finishes and slightly different shapes. Many people have been happy with the Crystal Clear Supply Water Filter Reverse Osmosis Faucet. The Zuhne Ren Lead Free Food Grade Stainless Steel faucet is made entirely of stainless steel is very well rated. The Avanti Membrane Technology designer RO filter Drinking Water Faucet is an air-gap faucet for those that want or require air-gap functionality.